B1 was graced with a terrific guest last night, a little-known treasure from our own backyard, Ron Sorin! Ron's days of gigging with the likes of Big Shoulders were cut short when he made the decision to be a responsible family man, but thanks to Joe's support and interest, he's being coaxed back onto the scene. He credits his previous visit to B1 as inspiration to record. We celebrated the release of his recent CD, Lake City last night with tons of great playing and inciteful thoughts on playing the harp. Special thanks to his buddy, co-producer, Blue Coast Bandmate, and webmaster Harlan Terson for playing bass with the B1 Band. Walking is a medium shuffle - Ron gets most of his writing and composing done while walking. Learn all you can from a guy like Joe but remember to value time spent on your own listening to the records! If you're thinking about what you just played, you're in trouble. If you're thinking a little ahead, good. If you're not thinking at all, that's the best you can hope for. "My improvisation came from laziness - I had the blues language background and wanted to talk; I wanted to speak for myself." What does Ron look for in a harp player? Background and history in the blues and with the instrument. And most often overlooked and left unmentioned, taste. He wants to see the player making music! He loves a certain amount of unpredictability and wild side in a player. It was a terrific night in B1. 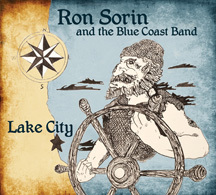 Enjoy your Ron Sorin CDs and get out to see him play at the Smokedaddy, February 24. Thanks, Ron! Hohner Announces Harp Maintenance Videos!!! "In an unprecedented step for a major harmonica manufacturer, Hohner has released a whole series of professional quality harmonica service videos aimed at the player which have now been uploaded to the links below. Demonstrated by Gabriela Hand, head of chromatic harmonica manufacture in Trossingen and presented by myself, these HD videos provide detailed information on many major aspects of harmonica maintenance and also introduce the new Hohner Instant Workshop toolset, designed to enable easy reed replacement in addition to all other maintenance operations covered in the videos. The overall concept is the brainchild of Hohner Service Department head Michael Timler and the official launch will take place at NAMM. Though primarily dealing with the chromatic harmonica, many of the subjects covered in the videos such as tuning, centering, reed offsetting or reed replacement are applicable to all types of harmonica and will undoubtedly be equally useful for diatonic players. The tools and techniques presented here will also be invaluable for harmonica technicians and may well revolutionize harmonica repair by rendering it accessible to everyman. In an era where more and more commodities are seen as being disposable, it's a welcome sign that things don't always have to be throwaway! Here is the first link to the videos (the other seven appear to the right):"
Our man Highway RickEy passed along news that Coast 2 Coast Music has a bunch of harp-related gear and music on clearance. Check it out!